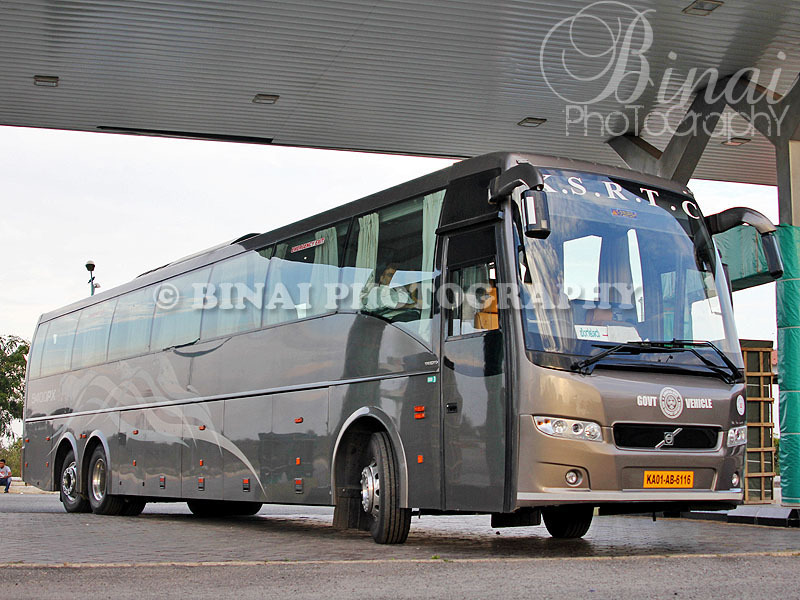 One fine morning, updates on Facebook scream out that KSRTC is launching India’s longest intercity coach – the all new Volvo 9400PX. This bus is 14.5M long, and is based on the all new B11R chassis powered by a 370-hp 11 litre rear mount engine, with Volvo’s famous iShift automated manual transmission system. 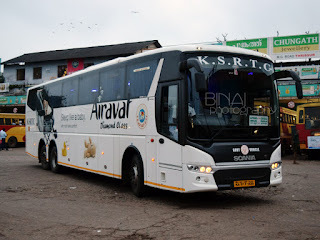 There was no news of the bus for a few days after it was inaugurated – but one day it appeared on the KSRTC reservation portal as “Airavat New I-Shift Multi-Axle”. I made a plan to travel on the bus with a good friend of mine – but later, both of us had difficulties and we had to drop the plan. To make up for our inability to travel, we spend a day to shoot the bus. A few days went past. A trip planned long ago was dug up from the archives – the planning was quick. Trains were unavailable – and, as if it was godsend, I decided to travel via Chennai. The PX was an obvious choice for the journey. The planning of the journey ahead was a bit tricky and I was in a fix for quite some time. Tickets for all legs of the journey were booked about a week prior to the trip. The days in the run-up to the journey were spent tracking the seat availability of the PX almost daily. My adjoining seat remained vacant throughout. My brother dropped me at Shantinagar at around 2225hrs. My bus was still around 40 minutes away. Shantinagar was very busy at that time – it was buses everywhere. The KSRTC counter was crowded – there were about three inspectors patiently responding to passengers at that time. The layout of Shantinagar bus station tests the patients of passenger heavily – buses are parked haphazardly, and its chaos everywhere. My bus was to come on Platform “3”. Platform 3 is a BMTC platform during the day (used by buses going towards South Bangalore). There was a long line of KSRTC Airavat (and Club Class) buses at this platform –all of them were to Chennai. Every bus had a board or a marking mentioning the departure time, and crew were seen shouting the departure time as well. Time went past very quickly. The Airavat Gold Class to Chennai (9.40pm departure) came in only at 2245hrs. The bus did not have many passengers. Even as the Gold class prepared to depart (2255hrs), there was no sign of my bus. I decided to find out if my bus was really running, or if they had sent a replacement. I walked past seeing every bus, and found one bus without a time board or marking. I could feel my heart missing a few beats. I mustered some courage, and headed to the driver to find if it was my bus. I asked, “Is this the 2310 bus”. He replied, “NO. This is 2305 bus”. I heaved a sigh of relief, and slowly walked back to the entry point of the bay. 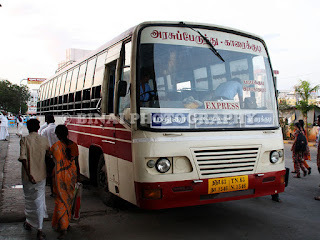 There were lots of SETC buses heading to Chennai – some with less than 10 passengers. On the other hand, KSRTC Rajahamsa buses had better crowd. Sometime around 2305, I spot the black whale slowly coming from the depot. The distinct while light from the HID Lamps looked very attractive as the bus slowed down and curved into the bus station. The crew kept the doors locked for some more time, as they prepared the bus for departure. Boarding started at 2315hrs. The crew did not check tickets, but offered assistance to people with heavy baggage. The dickey was kept open. The engine was switched off as passengers were boarding. 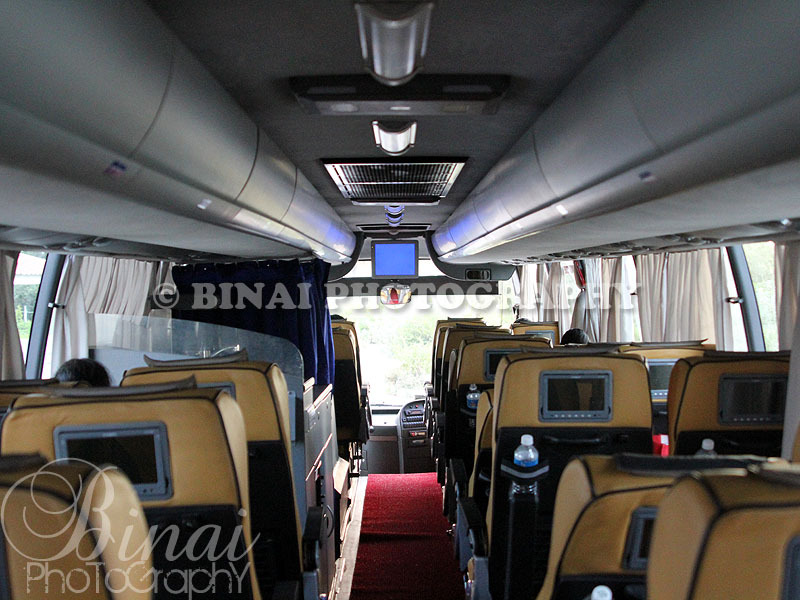 I took some photos inside the bus and then headed to my seat. I had chosen a seat in the rear half of the bus to see how the bus behaves at curves, and how it manages tight turns. A quick description of the interiors: The interiors have a classy look. All the seats have individual LCD screens, which are plush fitted to the rear panel of the seat, unlike the extra fitting look that is seen in Airavat Bliss buses. The overhead luggage racks have closures – made of aluminum and supported by gas filled support struts. The closures meant that it was difficult to stow luggage in the racks – the size of the opening was reduced. The leg space was humungous. The bus had only 41 seats. Some seats did not have calf support – especially the ones near the pantry. The Pantry and the Toilet ate up a lot of space in the bus. I left my baggage on the rack and took my seat. Booking was very light, and the conductor was trying to get more passengers into the bus. The engine came alive around 2325hrs. The engine sound was somewhat different from that of the B9R. AC was switched on immediately. The reading lamps were also switched on – but the individual lamps switched did not work! The driver was moving the bus forward as and when the bus ahead moved. The conductor checked the tickets in the mean time. I must write this – the conductor, a very senior crew, was extra polite. He said “Excuse me” while alerting passengers for the ticket, and politely requested people for the ID proof. He thanked the passenger before moving on to the next passenger. 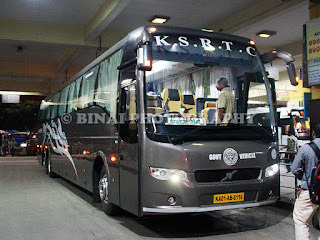 KSRTC’s crew behaviour has always left me astonished. The bus started from Shantinagar at 2335hrs – a good 25 minutes late. The driver handled the bus amazingly – there was absolutely no struggle to get the bus out of the bus station, and manage the 90-deg turn towards Lalbagh road. The pick-up was just awesome – I was enjoying every minute as the bus picked pace. The conductor came around and distributed water bottles. He came later to take back the blankets kept on vacant seats. I decided to play around with the LCD screens for some time – some 5 channels were showing up – 2 of them were displaying Volvo promotional videos, one was showing a static map (guess that was a demo of the option GPS system – it was kind of a moving map, with provisions to show current speed, distance, etc) and one was playing MP3 music. I did not have a headphone (nor did they provide one) – so could not check if that was only a demo display or if it really played songs. One channel was blank. There was a lot of static disturbance – the picture was all grainy and wavy. In the meantime, we stopped for a pickup at Diary Circle (2343hrs) and later near St. Johns Hospital (2348hrs). The driver was in no hurry – he was maintaining a very sedate pace, may be around 80kmph or so. The iShift was doing a great job by not allowing the engine to be lugged (a characteristic in Airavats). There was no perceivable change in the ride comfort due to iShift – the jerks during low gear shifts were still felt. The engine sounded relaxed though. There was a bit of traffic around Bommanahalli, even at that time! We slowly made our way towards Electronic City, reaching there at 0000hrs. A couple of passengers joined in – this was the last of passengers to board. 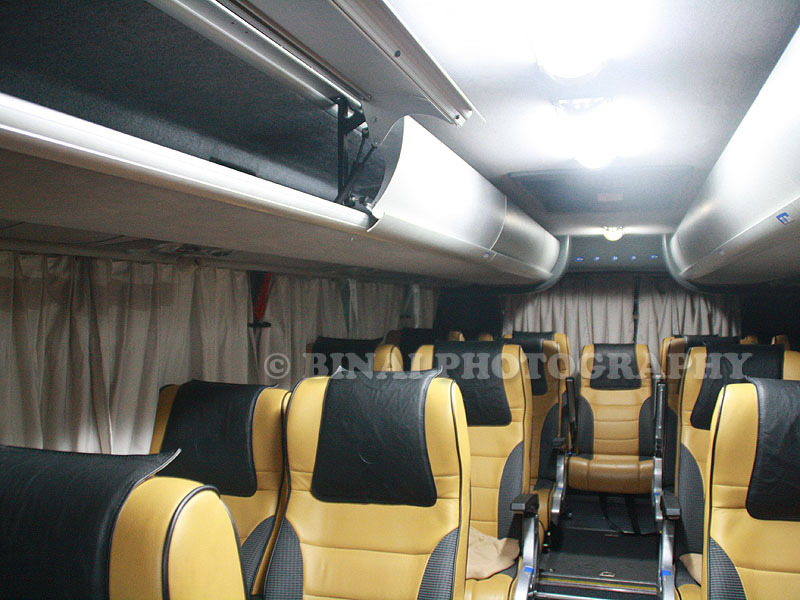 As the bus started moving, the conductor tied a blanket at the front, to act as a curtain shielding passengers from headlights of oncoming vehicles – being a demo bus, there was no provision for a full size curtain separating the driver cabin. 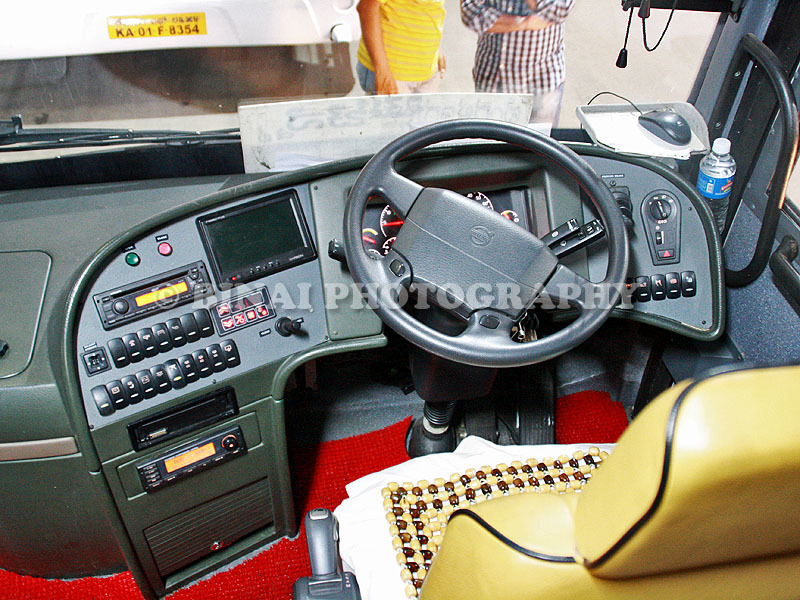 The lights were switched off and the driver meant business as the bus neared Chandapura. For some vague reason, they did not take Chandapura flyover, and decided to go below. The driver picked pace after Chandapura and we did fairly good speeds as we crossed the border. The bus took the Hosur flyover – there were enough empty seats, and I was expecting the crew to try getting more passengers at Hosur – but they proved that they were a breed apart. I’ve noticed this fact that KSRTC avoids picking up passengers from stations where there is no scheduled pick-up point. I slowly made myself comfortable and tried catching up some sleep – but the humongous leg space meant that I kept slipping from the seat very often! I somehow kept dozing off now and then. We got stuck in a horrible traffic snarl after Hosur – as we entered the ghats. The bus was standstill for quite some time. I do not know how long the traffic block lasted, but I remember seeing the bus cross the Krishnagiri Toll plaza at 0245hrs! I had a very nice sleep after the toll gate. I woke up only when the bus reached Maduravoyal! The time was around 0555 or 0600hrs then. The driver had done a great job – it was clear that he kept great speeds through the night – but not a single incident of rash driving or braking anytime! The bus got into CMBT at 0611hrs, late by just a minute! The scheduled arrival at Chennai was 0610hrs, and we reached at 0611hrs! We had departed late from Bangalore, but still made it more or less on time! The journey took 6h 36minutes including the horrific traffic block between Hosur and Krishnagiri! Concluding remarks: The Volvo 9400PX is a great product. The steerable rear-tag axle has helped in improving manoeuvrability of the bus greatly. I was specifically looking forward to how the bus manages the turn from Shantinagar bus station. It impressed me nevertheless. The interior fittings looked great – but quality was not good. The overheard luggage rack doors rattled all the time. The coffee maker installed on the pantry table top also rattled badly – the rattles did irritate a lot, especially when the bus went through bad patches. 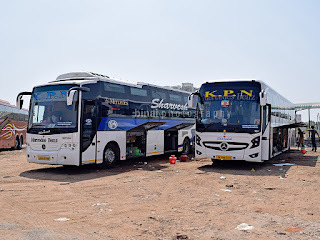 I did not feel any perceivable difference in jerks at the time of gear shift – I felt well trained and well experienced drivers handle the jerks really well even in manual transmission buses. The iShift certainly does not make any difference to the passenger, as such, IMHO. The engine sounded less strained – the extra HPs helped the bus really well. 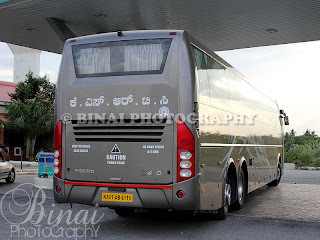 The KSRTC crew behaviour was great as usual. (Not that I am making blanket praise on KSRTC crew – I’ve encountered black sheep many times). I do not have much to write about the service – for this review is more about the hard product (the bus) than the soft product (the service). 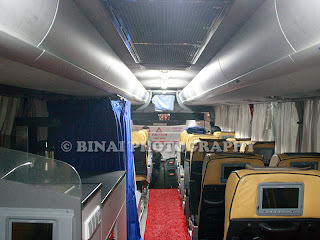 Space Utilisation: 3/5 (Too much space wasted – it’s anyway a demo bus! 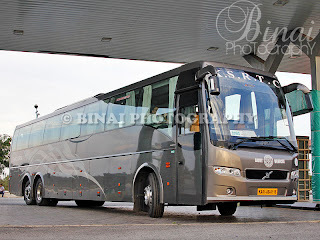 The Volvo 9400PX is a great product... THE END! Nice review bro. Have to admit it -- your reviews are truly a class apart -- very informative and usually unbiased too. Some doubts: Seems they didn't provide food on the bus even though its a night ride. Did they? The LCD panels didn't had earphone-no loudspeaker? And the normal LCD in front-what does it show? Finally, is it very far good than B9R ishift? A great review on the present king/queen of Indian Intercity travel. 14.8m length means it should be able to accommodate around 54 semi sleeper seats right. Since it was a pure night trip, they did not play any movie/video/songs on the general entertainment system. The LCD at the front was on, but they covered it with a cloth. Honestly, I did not find anything great about the iShift. @Vinchen. The length of 9400PX is 14.5M. It should be able to take 48 Semi-sleeper+regular seats, or may be 57 regular seats. I love your reviews on buses. I have some doubts regarding volvos. What is the difference between b11r,9400px,9400xl. It will be nice if you post a dedicated column explaining with images.